The 2018 Optician Awards took place on Saturday 14th April at the Hilton Birmingham Metropole and, as previously announced, Indie Grewal of Leightons St Albans was a shortlisted finalist. Despite some very strong competition in his hotly-contested category, we are absolutely delighted to say that Indie won the Contact Lens Practitioner of the Year award! What are the Optician Awards? 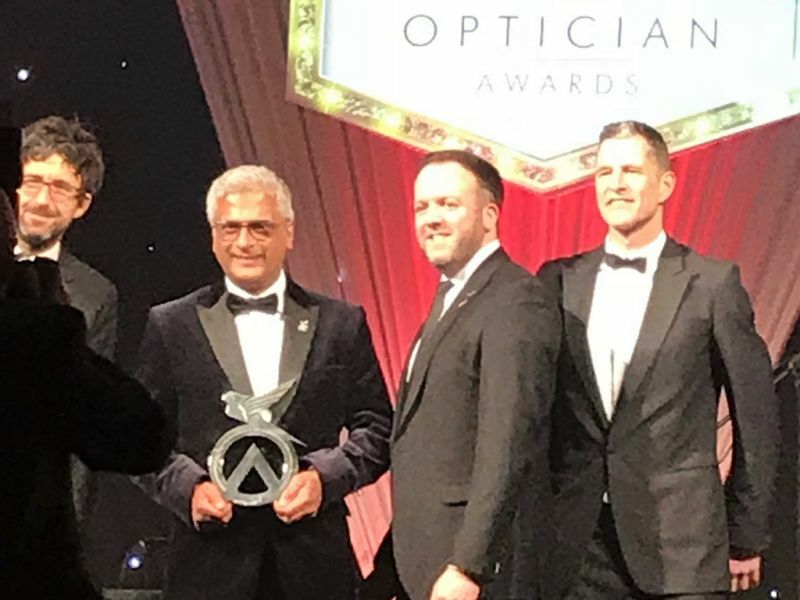 The Optician Awards are widely recognised as a true benchmark of excellence within the optical industry, showcasing the pinnacle of clinical excellence and care across a range of categories. In choosing the winner of the Contact Lens Practitioner of the Year, the panel of judges were not looking at achievements in research, but at practitioners who, through their work in a local high street practice, are changing the lives of their customers on a daily basis. They were looking for a practitioner who has not only embraced contact lenses but is a prominent advocate for their use, looking at how contact lens options are discussed with customers and how benefits to each individual can be made clear. In short, winning the Contact Lens Practitioner of the Year award is recognition for the way in which Indie Grewal, alongside the Leightons St Albans team, helps more and more people to live their lives to the full as part of the Leightons family. Contact lenses are an incredibly important part of the eye care services available across all Leightons branches. As well as offering the wearer a different look to glasses and providing several obvious benefits to those who participate in sports where glasses may be inconvenient or dangerous, they have many clinical advantages too. The range of contact lenses available today cater for a huge variety of individual requirements. Single use daily lenses and monthly lenses are now more comfortable than ever, making use of ever-advancing lens technologies. And it’s not just “straightforward” prescriptions that are suitable for contact lenses: multifocal contact lenses can be fitted for presbyopia, orthokeratology lenses can be fitted for overnight vision correction and ground-breaking MiSight lenses can even be fitted to help correct myopia in children. For more information on the range of contact lenses available with Leightons St Albans, whether you’re a current wearer or just considering the idea, you can book an eye examination and free contact lens trial with us today. Call 01727 865 348 to speak to one of the team, or you can book an appointment online. Alternatively, if you’re not in the St Albans area, visit our Branch Finder to find your local Leightons branch or call us on 0800 40 20 20.